“For us, Van Wagner Sports & Entertainment represents the complete guarantee that commercialization of Espai Barca will be a success and the security that the world market will be analysed within the parameters and requirements that the club has set at this stage of transformation,” said Manel Arroyo, FC Barcelona Vice-President of Marketing and Communication. NEW YORK & BARCELONA, Spain--FC Barcelona, one of the most popular and valuable sports brands in the world, has appointed Van Wagner Sports & Entertainment (VWSE) as its exclusive partner to manage worldwide naming rights and sponsorship for its historic new Espai Barca development project, transforming the iconic Camp Nou stadium into the biggest and best equipped urban sports facility in the world. The $600 million undertaking, encompassing all of the sports facilities that FC Barcelona has throughout the city center, will begin in 2017 and be completed by 2021. 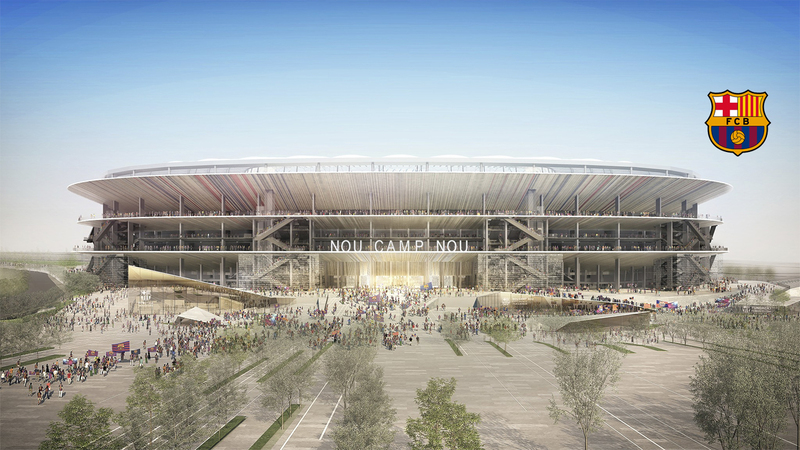 The project will convert Camp Nou, the largest stadium in Europe, into a next-generation venue featuring over 105,000 seats, a partial roof, premium amenities and immersive fan attractions. Espai Barca also will include a renovated 12,000-seat Palau Blaugrana Arena, which is home to basketball, roller hockey and futsal teams, as well as the opening of a sports campus highlighted by a new Palau 2 arena, ice skating rink, social and commercial zones, team offices, a rejuvenated La Masia training academy and 5,000 additional parking spaces. VWSE, a preeminent global sports marketing and media sales organization, will feature a new European office to manage the momentous project through the firm’s one-stop consultancy – VWSE Team and Venue Services Division – led by Senior Vice President Chris Allphin. VWSE experience includes more than 18 naming rights transactions totaling nearly $3 billion since 1998, including recent deals that saw SunTrust Bank brand the new stadium being constructed for the Atlanta Braves, and US Bank atop the new Minnesota Vikings stadium. The firm and its team have been involved in numerous other naming rights deals for teams, including the New York Jets and Giants and Arsenal FC. Van Wagner Sports & Entertainment, LLC (VWSE), a wholly owned subsidiary of Van Wagner Group, LLC, is one of the preeminent sports marketing and media sales organizations in the world. It is an acknowledged innovator in property consulting and branding solutions and a global leader in naming rights, team and venue services, high-impact visible TV signage throughout the MLB, NBA, NCAA, MLS, and internationally in soccer, advertising and sponsorships sales, premium ticketing, technology design and integration, and in-venue content production. VWSE assists teams, organizations and properties in creating and selling advertising; sponsorships; and media that maximize revenue potential, and helps clients develop effective and powerful customized brand campaigns. VWSE works with more than 300 professional and college teams worldwide.